Flat Bock seems to get around. His presence is seen and felt everywhere. Today I logged in to find him chatting up my store model. Flat Bock chatting up Aled the model at my store. Then I had to check in at the SNO (the airport at Second Norway) for a flight I have later on and I caught a glimpse of Flat Bock doing pre-flight on a small plane. He does really get around. Please share any additional sightings you might have. As you all know the Second Pride Festival has begun (link here drops you in front of info kiosk). One of the best Pride month finds I have come across isn’t at the festival. 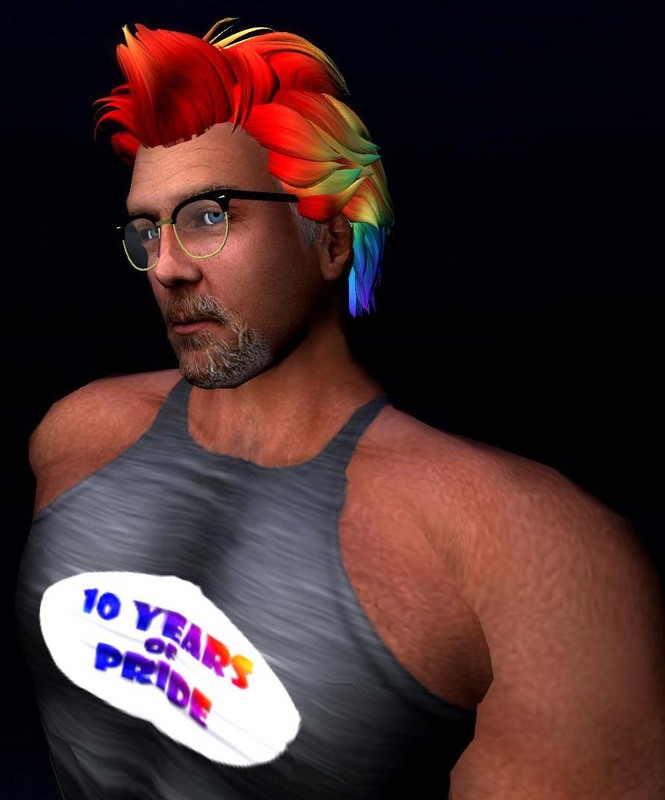 One of my favorite hairstylists (Kavar Cleanslate – EXILE) has made a special pack of hair for pride. Its available for free at his main store here. Its sitting in a rainbow box on the fireplace. The box has 6 different styles in it I am sure something for everyone. Here is the one I have chosen.